Most neuroendocrine tumors have five highly specialized receptors that bind to the naturally occurring hormone somatostatin. 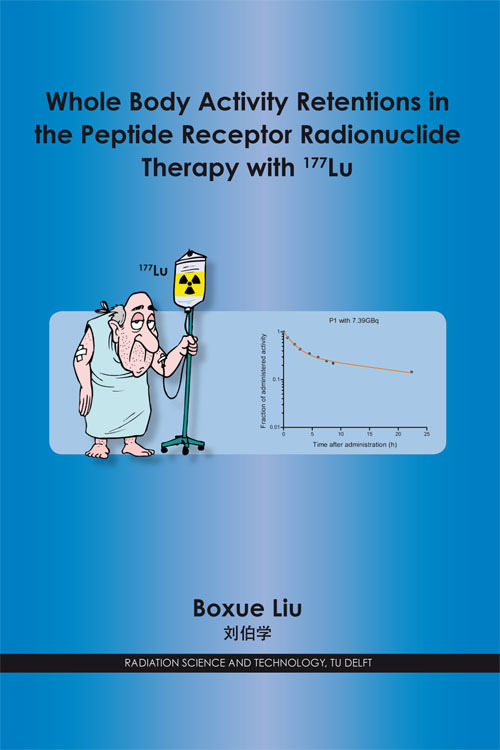 Peptide receptor radionuclide therapy (PRRT) combines compounds capable of attaching to receptors with a radionuclide such as 177Lu. These can then be administered, and will circulate throughout the body, binding to the tumor cells which have receptors for them. Once bound, these radiopeptides emit radiation which kills the tumor cells they are bound to. This book describes a research project of which the goal was to develop a patient-friendly technique which could also deliver an accurate estimate of the whole-body activity of 177Lu. The practice used to date – a system based on urine collection by the patient – has proved not only to be inaccurate, but also unacceptable for some patients. It also represents an a potentially harmful increase in the risk to the medical staff involved of exposure to radioactive substances. Two alternative methods were developed with the potential to overcome the drawbacks of the urine collection method: (i) direct measurement of the activity in the excreted urine and (ii) direct measurement of the remaining activity in the whole-body using external detectors. The research described here was financed by NUTSOHRA and carried out by the Section for Radiation and Isotopes for Health, Department of Radiation Science and Technology at Delft University of Technology, in collaboration with the Department of Nuclear Medicine of the Erasmus MC in Rotterdam.